From left are Mike Robertson, director of Park Operations for Tennessee State Parks; Kenny Gragg, area manager for Tennessee State Parks; Anthony Jones, ranger at Cumberland Trail State Park; Jordan Sikkema, park manager, Cumberland Trail State Park; and Brock Hill, deputy commissioner of TDEC. Not pictured: Bobby Fulcher, park manager, Cumberland Trail State Park. 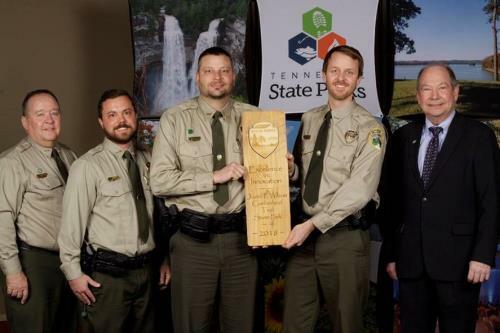 The Tennessee Department of Environment and Conservation (TDEC) has honored the Justin P. Wilson Cumberland Trail State Park with the 2018 Excellence in Innovation award. State parks nominated for the innovation award were those that demonstrated an ability to “think outside the box” and create new ways to improve their parks. An innovative project had to be long-lasting or far-reaching, and Cumberland Trail State Park met the criteria in a significant way. The park was faced with the challenge of installing bridges into remote and rugged areas. Staff at Cumberland Trail partnered with Gator Bridge and worked to design an aluminum bridge that could be hauled into backcountry areas in sections. As a result of the park’s success with this new structure, Gator Bridge has named the new bridge design the “Cumberland Trail Bridge System”. The bridge system is designed to be cost-effective and functional far into the future. The system is easily repairable – damaged sections can be repaired only by replacing the section in need. Park Rangers also came up with an installation method using rigging that allowed them to fly bridges safely over creeks without having to haul scaffolding. That cut installation time by 50 percent, greatly reducing labor costs. The Justin P. Wilson Cumberland Trail State Park, a Tennessee scenic hiking trail, became Tennessee’s 53rd state park in 1998. It is Tennessee’s first linear park, cutting through 11 counties. For more information on the park, visit https://tnstateparks.com/parks/cumberland-trail.